The presence of water on Mars has been theorized for centuries. Early telescopes revealed ice caps, and early astronomers noted channels that were hypothesized to be natural rivers or creature-created canals. 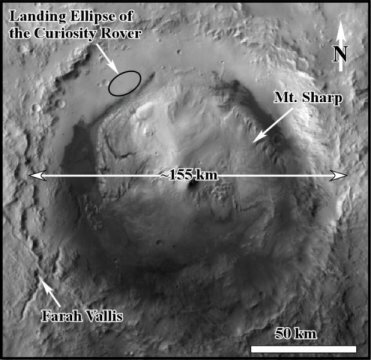 This is the physiography of the Gale Crater shown in a HiRISE map. The presence of water on Mars has been theorized for centuries. Early telescopes revealed ice caps, and early astronomers noted channels that were hypothesized to be natural rivers or creature-created canals. Over the past two decades, rovers Sojourner, Spirit, Opportunity, and Curiosity have sent back invaluable data to scientists who are trying to interpret the planet's surface and uncover evidence of past or present water. Since its landing on the "Red Planet" in August of 2012, Curiosity Rover has traveled about 20 kilometers within Gale Crater. The rover has examined about 400 meters of sedimentary rock that exists in the crater, says Ezat Heydari of Jackson State University in Jackson, Mississippi -- including rocks thought to be 3.7 to 4.1 billion years old (Noachian time). Heydari and colleagues used these images of sedimentary rocks to interpret the geologic processes that occurred billions of years ago on Mars. He is presenting their findings on Sunday at the Geological Society of America Annual Meeting in Indianapolis, Indiana. Within those 400 meters of rock, the researchers identified four different units that represent different types of deposition, and Heydari says that "in my opinion, deposition of all of these packages involved water." One of those packages, called the Hummocky Plain Unit, is a conglomerate with grains up to 20 centimeters in size. The Curiosity images showed ridges in the Hummocky Plain Unit, filled with rounded cobbles and cross beds reaching 4 meters high -- indications that deposition was done by moving water. In addition, some of the images have height information that can create a topographic profile of the surface, revealing the profiles of the ridges. "These ridges are asymmetric," says Heydari. "In other words, they were formed by one directional current." After seeing the images, Heydari says he immediately thought of the Channelized Scablands in Washington State. The Mars ridges are equally spaced, he says, adding that they are about twice the size of those in the Scablands. The ridges on Mars and Earth had similar characteristics, but it wasn't until he saw the cross beds that Heydari concluded the Mars deposits were made by large-scale flooding. Using comparisons to Earth rivers, Heydari notes that to create cross beds 4 meters high, the flowing water would have been about 10 to 20 meters deep. "That's one of the reasons I say these deposits are related to floods, rather than a puny river," he says. Heydari says that the Noachian sedimentary rocks found in Gale Crater may have been deposited in a similar setting as Pleistocene Earth (about 2 million years to 12,000 years ago), with large-scale global ice and dramatic outburst floods. "On both planets, one hemisphere was covered by ice -- northern Hemisphere on Earth, versus the Southern Hemisphere in Mars -- and the other hemisphere was warm," says Heydari. He adds that this comparison is important because it shows that ancient Mars appears to be very similar to Pleistocene Earth, where liquid water is stable and able to support life.